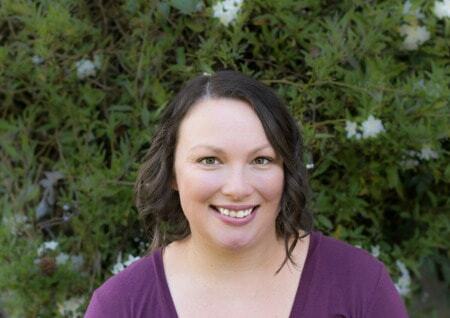 May 4, 2018 By Aileen 3 Comments This post contains affiliate links. As an Amazon Associate and member of other affiliate programs, I earn from qualifying purchases. Banana Blueberry Muffins with Vanilla Glaze have all the moisture of a banana muffin with an extra pop of flavor, thanks to the real blueberries. The vanilla glaze recipe is perfectly sweet. Good luck eating just one! These muffins are so good. 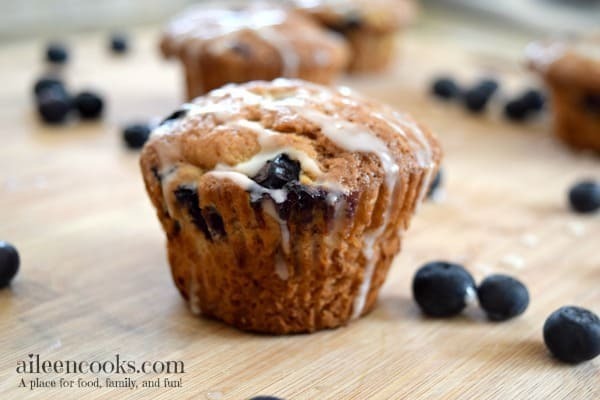 They have the best of both worlds – the sweet and moist banana muffin plus the tenderness of a blueberry muffin. The muffin glaze makes it an extra special treat. So special that this batch of moist banana blueberry muffins lasted one afternoon in my house. Normally, a dozen muffins will at least last us to the next day. Not these banana blueberry muffins. They were too good to resist. I think part of the reason why these banana muffins are so good is because they are banana blueberry muffins with yogurt. 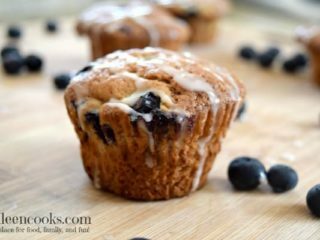 The addition of greek yogurt into these recipes takes these easy moist banana blueberry muffins from good to great. If you have never glazed a muffin, you may be wondering how to do it. I’m here to tell you it’s easier than frosting a muffin. Simply take a scoop of the glaze with a spoon and slowly move the spoon back and forth over the muffin at an angle. The beauty of glazing muffins is the beauty is in the mess. You want the vanilla glaze to drip off the sides of your banana blueberry muffins. They say you eat with your eyes first, and a glazed muffin always makes me hungry! 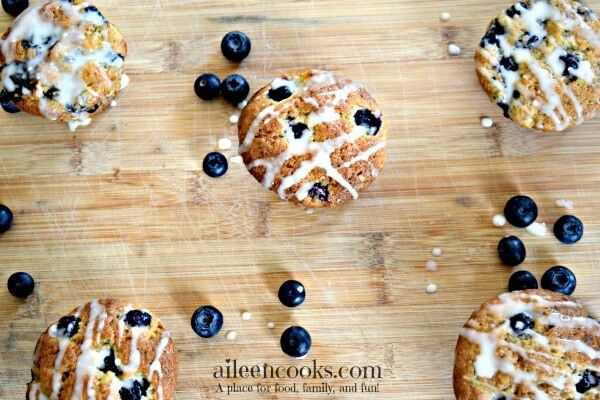 These banana blueberry muffins with vanilla glaze are an bakery style muffin with large muffin top and delicate crumb. Preheat your oven to 350 degrees. Grease a standard muffin tin or fill with cupcake liners and set aside. In a large bowl, whisk together the flour, sugar, baking powder, baking soda, salt, cinnamon, and nutmeg. In a medium bowl, mix together the Greek yogurt, eggs, melted butter, 1 teaspoon vanilla extract, and mashed bananas. Make a well in the flour mixture. Pour in the banana mixture and fold until just combined. Mix in the blueberries. Fill each muffin cup until completely full (not 3/4 full or you won't get a good muffin top). Place in the oven with a cookie sheet underneath to catch any drips. Bake for 40 minutes, or until a toothpick inserted in the center of a muffin comes out clean. Allow the muffins to fully cool. To make the glaze: whisk together the powdered sugar, milk, and remaining 1 teaspoon vanilla extract until a glaze is formed. Add additional milk, if needed. Refrigerate the vanilla glaze until ready to use and remix prior to glazing the muffins. Drizzle the glaze over each muffin and enjoy. Refrigerate leftover banana blueberry muffins with vanilla glaze. 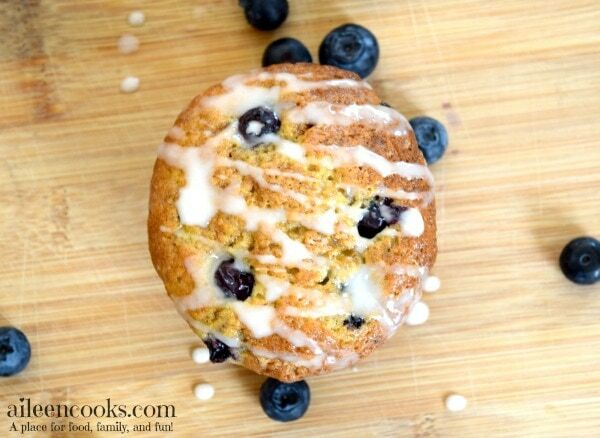 Did you try this recipe for banana blueberry muffins with vanilla glaze? Please consider leaving a rating and comment. Oh man those look delicious!! I love blueberry muffins!! These are best after 2 days in the refrigerator. I used buttermilk instead of Greek yogurt. I didn’t put on the glaze. I will make them again but I’ll add chopped pecans. I left the blueberries our of 2 of them for my husband. He really liked them. It sounds delicious with chopped pecans. Yum!